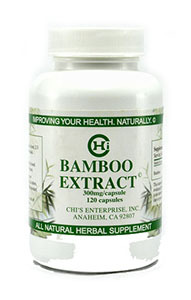 Each capsule of Bamboo Extract contains 500 mg of pure bamboo extract. "Bamboo extract contains full amino acids, vitamins and minerals... It provides Normal immune health support." Take 2-3 capsules 2-3 times daily after meals. The next generation silver. The professional version of Sovereign Silver. Now in 32 fl ounces.